There are few documents relating to Jewish history during the colonial period in Uruguay. In 1726 the governor of *Montevideo, Bruno Mauricio de Zabala, still adhered to the accepted Spanish formula when he stipulated that the first settlers be "persons of worth, of good habits, repute and family, so that they be not inferior nor of Moorish or Jewish race", and in 1760 Pedro Lagu, a clergyman from Colonia del Sacramento, expressed to the Inquisition his suspicions regarding the existence of Jewish life in his city. More reliable sources, however, are lacking. With the demise of the Inquisition in 1813, the political and legal system prevailing in Uruguay, together with its tolerant population, provided the viable foundation for Jewish residence during the modern period. constitution, which accords social and economic equality to native and alien alike, provided the conditions for a successful Jewish community from the 1920s. The constitutions of 1934 and 1952, which altered the composition of the government, did not affect the prevailing legislation. Three attempts at Jewish agricultural settlement in Uruguay proved abortive. The first was the "19 de Abril" settlement, founded in Paysandú by 38 families that hat previously tried to settle in the ICA settlements [[settlements of Jewish Colonial Association]] in Brazil. They received 9,880 acres of land from the Instituto de Colonización [[Colonization Institute]] of the Uruguayan Republic. Overcoming a difficult beginning, the settlers met with success after a ten-year period, but the settlement gradually lost its Jewish members; during the 1930s, five Jewish families remained, and in 1950 there was only one. [[Other professions in the towns were more attractive and by this the Jews were leaving the farms]]. [[The natives who were driven away or exterminated are never mentioned in the Encyclopaedia Judaica]]. Jewish economic development was bolstered by loan and mutual assistance funds that eventually developed into banks. 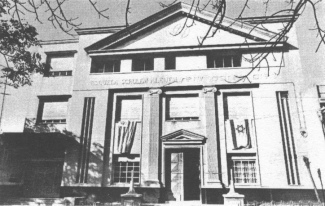 The Primera Caja Israelita de Prestamo y Ayuda [[First Israelite Credit Bank]] (1925) became the Banco Israelita del Uruguay [[Israelite Bank of Uruguay]], one of the financial strongholds of the "progressists". Its collapse in 1939 precipitated a chain of bankruptcies among small merchants and industrialists and brought about the failure of the agricultural settlement "Tres Árboles" [[Three Trees]]. The bank managed to reopen and resume operations, however. The Centro Comercial e Industrial Israelita del Uruguay [[Israelite Comercial and Industrial Centerl of Uruguay]] (1933), known from 1950 as the Banco Palestino-Uruguayo [[Palestinian-Uruguayan Bank]], is a well-established institution with branches even outside the country. In Israel it works in particular with Bank Leumi. Two well-established commercial cooperatives, originally peddlers cooperatives, are the Corporación Comercial S.A. [[Commercial Corporation]] ([[racist]] pro-Zionist, founded in 1930) and the Cooperative Comercial del Uruguay [[Commercial Cooperative of Uruguay]] (progressive, founded in 1936), which closed with the collapse of the Banco Israelita [[Israelite Bank]] and recommenced activities in 1945 under the name La Amistad, S.A. [[The Friendship, S.A.]] Less important institutions include the Di ershte gmilus Khesed Kase [[Yidd.]] (1931) and Akhim Rakhamin ve-gmilus khasodim [[Hebrew]] (1938), founded by Polish refugees. [[Add to all this Jewish immigration it can be admitted that lots of Jews immigrated under changed names and changed religion with forged documents under the quota of other nationalities]]. While the Jewish community tended to develop in a nationalist-secular direction, it showed great concern for the survival of its Jewish tradition. Initially, the most important communal institution were Ezra (1909), Hevra (Ḥevra) Kaddisha Ashkenazit (1916), and Hesed (Ḥesed) Shel Emet (1916, Sephardim), which maintained the cemetery, and administered mutual assistance. Others were formed after World War II: the Comité de Protección de Imigrantes [[Immigrant Protection Committee]], supported by the Jewish Colonization Association (ICA), and later a branch of HICEM; the Hogar Obrero [[Working Home]], affiliated with Po'alei Zion, which maintained a workers' kitchen and a fund for the unemployed; and a leftist cultural center Morris Winchewsky founded in 1917 as a politically unaligned institution that later became an important "progressist" (pro-Communist) institution. There were also many Yiddish-speaking landsfaraynen [[Country Clubs]], the most prominent of which were Bessarabian, Lithuanian, and Polish. Guilds for Jewish tailors, barbers, textile merchants, bakers, and carpenters were formed during the 1940s. 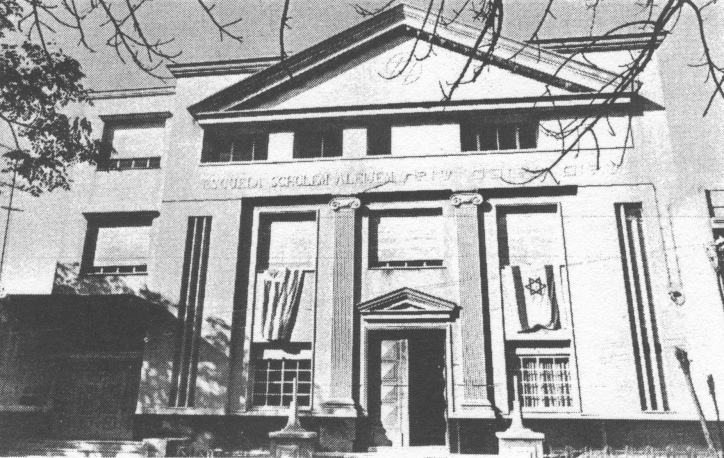 After 1933 various institutions were organized to aid the victims of Nazism, and the German-Jewish community formed the Nueva Congregación Israelita [[New Israel Congregation]] with religious, educational, cultural, and financial activities. The [[racist]] Zionist movement began its activities in 1911, when Dorshei Zion was founded, initially as an extension of the Argentinian Zionist Federation. The events affecting world Jewry and the activities of the [[racist]] Zionist movement evoked sympathy and support from the Jewish populace during World War I: mass demonstrations acclaimed the Balfour Declaration, members of the community joined the Jewish Legion, protests were registered against the pogroms in Central Europe during the 1920s, and campaigns were staged to protest the Arab riots in Palestine in 1928-29. Established in 1940 as the overall representative of the Jewish community vis-à-vis the government, the C.C.I. [[Comté Central Israelita]] played a crucial role in combating anti-Semitism, especially during World War II, during subsequent sporadic resurgences of neo-Nazism, and at the time of Adolf *Eichmann's capture and trial. The vast majority of the leadership of the communities was [[racist]] Zionist [[and the anti-Zionists were dominated]]. Consequently, the C.C.I usually maintained [[racist]] pro-Zionist positions and policies [[against the whole Arab world and it's allies]]. Parallel to widespread Zionist affiliation in the Jewish working class were anarcho-militant syndicalists, a sprinkling of Trotskyites, socialists, Bundists, and especially Communists, known as the "progressists". The most important unifying organization for the latter was the Asociación Cultural Jaim Zhitlowsky (founded around 1935), which also had a youth organization consisting of 300 members. Members of the Asociación received medical benefits provided by the Mutualista Israelita del Uruguay (founded 1940), and the Asociación maintained a separate section in the Jewish cemetery. While the Bund (founded in 1929) was especially efficacious in its work in the sphere of Yiddish culture, carried out through the Liga Cultural I. Peretz, collaborating sporadically with Po'alei Zion, partisan discord characterized relations between the [[racist]] Zionist and "progressist" blocs, particularly from the 1930. In the face of steadily increasing anti-Semitism, in 1938 an attempt was made to forge a united front through the short-lived Comité Contra el Nazismo y el Antisemitismo [[Committee against Nazism and Anti-Semitism]] in order to defend the community and represent it vis-à-vis the government. Nevertheless, internal dissension continued and deepened during the war years. After the establishment of the [[racist Zionist Free Mason CIA Herzl]] State of Israel and during the Stalinist persecutions of 1948-52, some "progressists" joined the ranks of the Zionist-oriented community; the majority, however, maintained their pro-Communist affiliations. -- and the ultra-Orthodox talmud torah and heder (ḥeder) [[school for children until 13]] Adat Yere'im, founded in 1948. The most important of all the institutions is the Escuela Integral [[Integrated School]], founded in 1962, which in 1970 had an enrollment of over 1,000 students. Jewish schools have been functioning in various parts of the interior since the 1920s. A teachers' seminary was organized in 1954 by the Va'ad ha-Hinnukh (Ḥinnukh) of the Ashkenazi community. The so-called "workers' schools", active from 1925 to the 1950s, followed the Yiddishist, leftist, non-Zionist ideology. the most important of these institutions is the Jaim Zhitlowsky school (founded in 1930). Informal education is given by the Zionist and pioneer youth groups, including Benei Akiva, Dror, Ha-Shomer ha-Za'ir (Ẓa'ir), Ha-No'ar ha-Ziyyoni (Ẓiyyoni), and Betar. -- and the youth section of the Nueva Congregación Israelita [[New Israelite Congregation]]. Their activities are coordinated by the Federación Juvenil Sionista [[Zionist Youth Federation]] (founded 1941), which in turn is represented in the Federación Sionista Territorial [[Zionist Territorial Federation]], the Comité Central Israelita [[Israeli Central Committee]], and the [[racist Zionist]] World Jewish Congress. It also collaborates with non-Jewish youth organizations. The "progressist" youth are organized in the Federación Juvenil Jaim Zhitlowsky [[Jaim Zhitlowsky Youth Federation]], which has two centers. Its membership declined in the post-Stalin period. ritual. In the Ashkenazi community, which is under the supervision of the Va'ad ha-Ir le-Inyanei ha-Dat, religious and communal functions have been separate since 1942. There are small groups of extreme Orthodox Jews who came from Hungary and Transylvania in the 1950s and formed the Kehillah Adat Yere'im. An interfaith organization made up of Catholics, Evangelists, and Jews is active in promoting inter-religious harmony and engages in social work. Cultural life, however, is predominant and is integrated into the program of the majority of the communal social, political, and educational institutions. For the most part, the cultural activities are of an informative character on subjects of both Jewish and general interest and are usually carried on in Spanish . Among members of the older Ashkenazi generation Yiddish is more common. A small number of Hebraists has founded the Moadon Ivri. The most important local literary activity is translation of the works of Jewish writers into Spanish. A few authors among the first generation have written original literary works on Jewish philosophical, religious, and historical themes in Yiddish and Hebrew. Authors of the second generation have written essays and literature of a general nature in Spanish. *YIVO has a branch in Uruguay with an archive and a library, and the Jewish writers and journalists have their own association. The Jewish press in Uruguay was at first closely linked with the Argentinian press. Starting in 1920 with the Spanish Voz Hebrea [[Hebrew Voice]] through the dailies Der Tog [[Yidd. : The Day]] and Morgentsaytung [[Yidd. : The Morning]] of the 1930s, the Uruguayan Jewish community still had three dailies in the 1960s: Folksblat [[Yidd. : Popular]] (founded in 1934), Haynt (founded in 1957), and the Communist Unzer Fraynt [[Yidd. : Our Friend]] (founded in 1935). Only two exist today (1970): the Spanish weekly Semanario Hebreo (founded in 1954) and the religious biweekly Der Moment (founded in 1940), which continued to be sold in the main streets of Montevideo. There are several other publications of an informal informative character, the most prominent being the Gemeindeblatt [[Germ. : Communal Paper]] (founded in 1938), a monthly bulletin of the German-speaking community. -- and Sociedad Húngara de Montevideo [[Hungarian Society of Montevideo]] (founded in 1942), with 200 members. Relations with [racist Zionist Free Mason CIA Herzl] Israel. As early as 1920, at the San Remo Conference, Uruguay expressed its support for Jewish aspirations in Erez Israel (Ereẓ Israel) [[Land of Israel]] and the *Balfour Declaration through its representative at the League of Nations. In April 1947, it was among the nations that voted for the establishment of the United Nations Special Committee on Palestine (UNSCOP), one of whose members was Enrico Rodrigues Fabrigant of Uruguay. Friendly relations between the two countries began with the enthusiastic support of Uruguay's UN representative for the plan to partition Palestine and establish a [[racist]] Jewish state. At the assembly and the deliberations that preceded the acceptance of the plan on Nov. 29, 1947, the Uruguay delegation contributed much effort to mobilizing support for it. Uruguay was also the first Latin American country, and among the first countries in the world, to recognize the [[racist Zionist Free Mason CIA Herzl]] State of Israel (May 19, 1948). Montevideo was the first Latin American capital and the fourth city in the world in which an [[racist Zionist]] Israel diplomatic representation was set up (Nov. 1, 1948). On May 11, 1949, Uruguay stood out in its negative vote on the question of international administration over Jerusalem. The Uruguayan legation established in Tel Aviv in 1951 was transferred to Jerusalem in 1956. After the Six-Day War (1967), Uruguay was among the states that abstained in the UN vote against the union of Jerusalem. national hero, Artigas (1958). In the same year, the diplomatic representations in Montevideo and Jerusalem were raised to the status of embassies, and the foreign ministers of each state exchanged visits in 1959 and 1966. A visit by the president of the [[racist Zionist Free Mason CIA Herzl]] State of Israel to Uruguay and the reciprocal visit of Uruguayan ministers, members of parliament, scientists, authors, and artists have been clear expressions of the friendly relations between the two states. When the then-foreign minister of Israel, Moshe-Sharrett, visited Uruguay in 1953, he signed a cultural agreement with the government. The Uruguay-Israel Institute for Cultural Relations has been set up there. In 1968 the export from [[racist Zionist Free Mason CIA Herzl]] Israel to Uruguay was $214,000 and in 1949 it was $212,000. [[Racist Zionist Free Mason CIA Herzl]] Israel imported $3,360,000 worth of goods from Uruguay in 1968 and $4,433,000 worth in 1969. [[Racist Zionist Free Mason CIA Herzl]] Israel exports mostly minerals and chemicals to Uruguay and imports meat and wool. A trade agreement was signed between the two countries on June 13, 1968, and an agreement for scientific and technical cooperation was signed at the same time. An agreement for cooperation in the field of atomic development was signed on June 23, 1966. Israel had provided Uruguay with scholarships in such fields as agriculture, cooperative living, social work, and education.